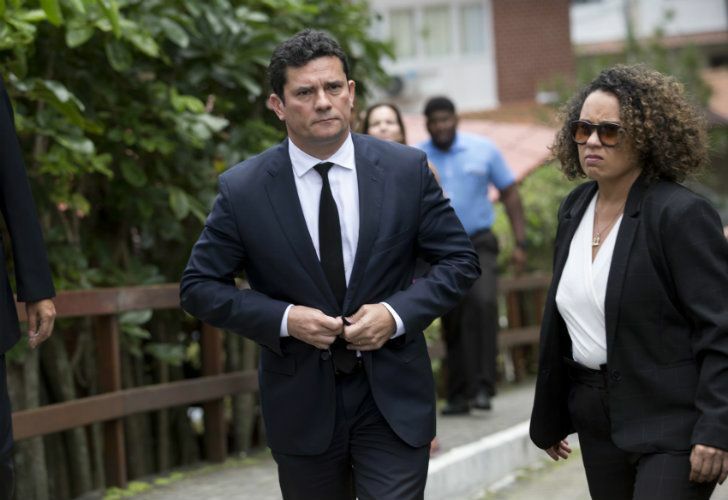 Sergio Moro, the Brazilian judge at the centre of one of the largest corruption investigations in history, has agreed to become justice minister in the government of Presidentelect Jair Bolsonaro. Sergio Moro, the Brazilian judge at the centre of one of the largest corruption investigations in history, has agreed to become justice minister in the government of Presidentelect Jair Bolsonaro, a decision that will be hailed by Brazilians eager for a crackdown on graft but also add to deep polarisation. Moro is wildly popular among conservatives and loathed by many on the left, so his decision to join the incoming administration will feed the suspicion of many Brazilians that the judge was politically biased in jailing former president Luiz Inácio da Silva, a conviction that forced the poll-leading leftist out of the presidential race. Moro met with Bolsonaro at the president-elect’s home in Rio de Janeiro on Thursday. Upon emerging, Moro said nothing but soon after he put out a statement confirming he had accepted an offer to lead both the Justice and Public Security ministries, which will be combined. Moro said it would be hard to give up being a federal judge after 22 years, but said he saw an opportunity to “implement a strong agenda of anti-corruption and anti-organised crime.” He added: “In practice, this will mean consolidating the advance against crime and corruption of the last years.” He said that the sprawling Lava Jato (“Car Wash”) investigation would continue in the hands of local judges in the southern city of Curitiba, where Moro lives and many of the cases have been tried. Launched in 2014, the Lava Jato probe uncovered elaborate schemes in which construction companies received bloated contracts and then kicked back billions of dollars in bribes to politicians and other government officials over more than a decade. The level of corruption was breathtaking for Brazilians long inured to graft, and the scandal has reverberated across several Latin American countries where Odebrecht, one of the companies at the centre of the scandal, did business. The investigation has led to the jailing of many of the country’s biggest names. That list includes Lula, convicted by Moro of corruption for trading favours with construction company Grupo OAS. Lula began serving a 12-year sentence in April. The cases made Moro a wildly popular figure; earlier this year, he tracked highly in presidential polls even though the judge did not run. Moro has been accused of being partisan, with supporters of Lula and the left-leaning Workers’ Party (PT) claiming the judge was at the centre of a conspiracy to keep Lula from running for president. The judge has convicted politicians from across the political spectrum. But he has also made decisions that many interpret as biased, such as releasing wiretapped conversations between Lula and thenpresident Dilma Rousseff in 2016. Still, the decision comes with huge risks, both for Moro personally and the future of theLava Jato investigations. Members of the “Car Wash” task force have said much work remains. In leading the combined ministries, Moro will be ultimately responsible for areas that include intractable problems, such as security. Last year, nearly 64,000 people were killed in Brazil, a record for the country. He will oversee the federal police, highway police, the penitentiary system, immigration and several other agencies with thousands of employees.